Rob Giesbrecht predicted it, and Harneet Dadrao delivered. Her scoring success fulfilled a prophecy Cascades head coach Giesbrecht made at halftime. “At the half, I told her she’d be the one to win it for us,” Giesbrecht said of his sophomore midfielder. “Brittney (Zacharuk) was effective most of the game getting behind them, so when she got their ball, their two centre backs dropped and there was a big pocket of space in front of them. 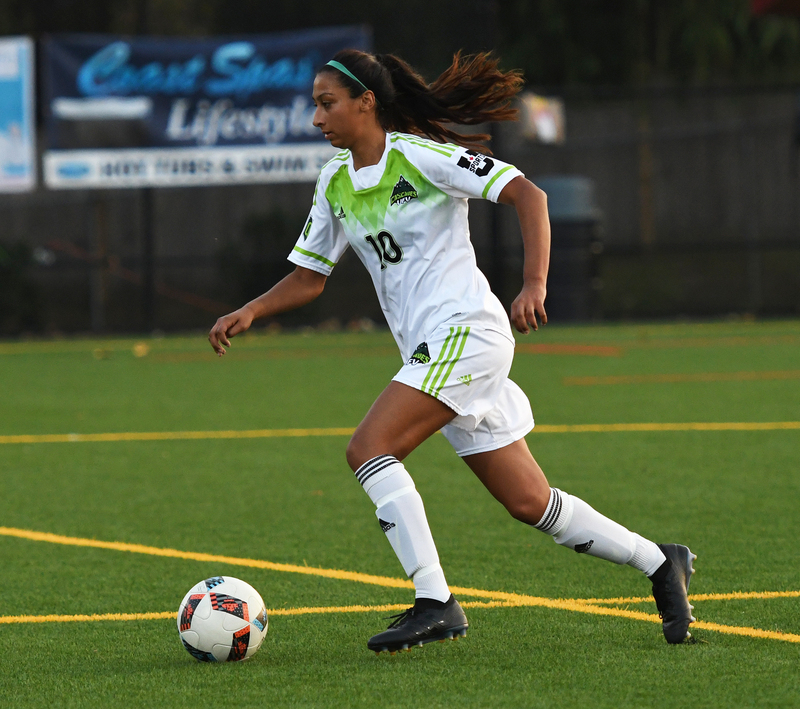 Tavia Jasper pushes the ball upfield for the Cascades. Friday’s first half was a low-event stretch of soccer, with neither team able to string together enough passes to create a truly great scoring chance. The second half, though, featured plenty of quality looks at goal. The lion’s share of those belonged to the host Cascades, who outshot the Cougars 9-2 over the latter 45 minutes. They had three great looks in quick succession, beginning in the 52nd minute when Gurneet Dhaliwal steered Zacharuk’s cross just wide. Shortly thereafter, Dhaliwal launched a rocket from the top of the box that Mount Royal keeper Rose Hemans leaped to tip over the bar. Off the ensuing corner, Kate Fisher got on the end of a ball from Vanita Bhullar, but sent it over the net. The Cougars generated a couple of chances of their own. In the 60th minute, on the counterattack, Haley Nicholson made a couple moves to evade UFV defenders and unleashed a shot from the right side that grazed the outside of the post. 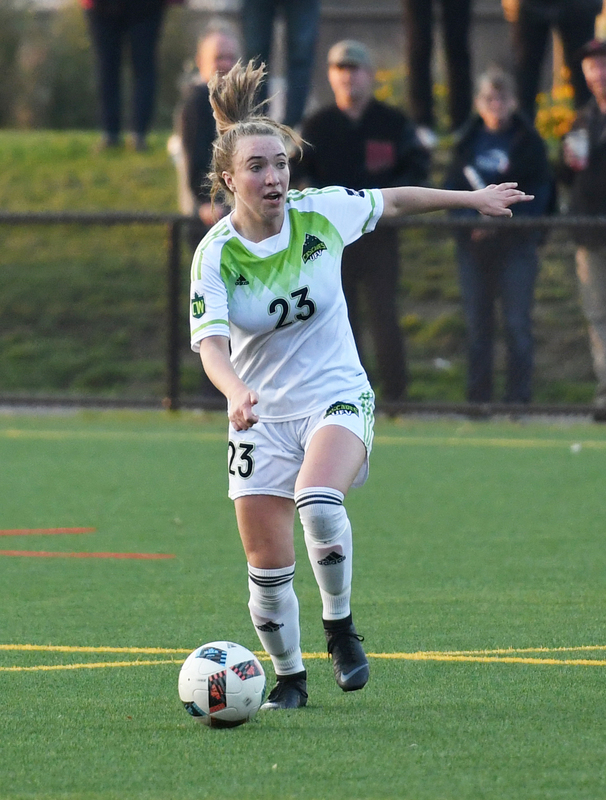 Nicholson came close again in the 74th, as her shot from the left bounced solidly off the crossbar and back into the box, but the Cascades were able to clear the ball out of harm’s way. Five minutes later, Dadrao struck. Zacharuk sent a pass from the left wing to Dadrao in the middle, and she fired a tremendous strike just under the crossbar, out of the reach of Hemans. It was her second goal of the campaign. UFV sophomore goalkeeper Joven Sandhu registered four saves for her second shutout. The win enabled the Cascades (4-5-2) to leapfrog the Victoria Vikes (4-5-1) for fourth place in the Pacific Division, though the Vikes have a game in hand. Mount Royal (5-4-2) sits third in the Prairie Division. “The three points are huge,” Giesbrecht noted. “We’ve thrown some points away this year, and we’re doing all we can to not let that hurt us. We have a very tough schedule being in the division we’re in, and our run in is tough. Mount Royal is sitting third in the Prairie Division, and we knew it was going to be a tough game tonight, and it was. The Cascades are back in action on Saturday evening, hosting the Alberta Pandas (5:30 p.m., MRC Sports Complex). Harneet Dadrao came through with the big play for the Cascades, scoring in the 79th minute.